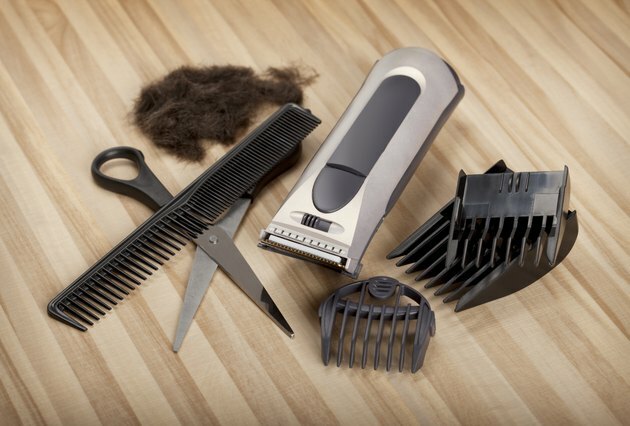 An electric hair clipper is handy for home use as well as an essential piece of equipment in a salon. Clippers come in contact with the scalp and skin, and since the skin can host many bacteria that spread disease, the clippers must be cleaned after each use. The straightforward task of regular cleaning and sterilizing will help keep your family or customers safe. Unplug the clippers from the wall outlet, and disconnect the cord from the unit. Knock the clippers on the edge of a wastebasket to remove loose hair. Use a cleaning brush, if your unit comes with one, to clean off tiny hairs. Wipe down the surface of the trimmers with an alcohol wipe. Inspect all crevices and indentations for trapped hair. Disassemble the trimmer. This means removing any foils, blades or teeth. Look for a button to pop out the accessories. The method of disassembling will vary based on model. Set up a container with a liquid disinfectant. According to the Florida Cosmetology Continuing Education website, this is the most practical method for sterilizing trimmers. Read the label on the solution for proper mixing and preparation. Drop all accessories into the container to soak. The amount of soaking time will depend on the model and type of disinfectant used. Do not submerge any electrical components of your clippers.